If you wanted to teach people the fundamentals of how to drive and had to buy new cars to support your business, what would be the most sensible purchase: several low cost compact cars, or one large, high performance vehicle that costs as much as the compact cars put together? Of course the answer is obvious. 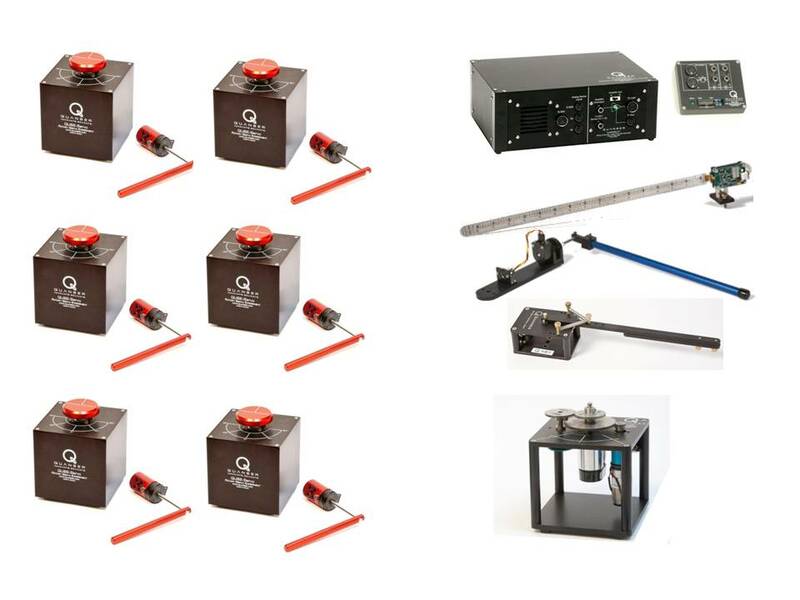 That kind of simple, cost-effective thinking is what drove Quanser to design the new QUBE™-Servo, a low cost, self-contained servomotor solution for teaching introductory control in undergraduate labs. For about the cost of a single Quanser flagship Rotary Servo SRV02 base unit with a data acquisition device (DAQ), amplifier and assorted add-on experiment modules, a professor or engineering department can acquire as many as six QUBE-Servo workstations. So, if your goal is simply to teach students “how to drive”, then a lab equipped with several QUBE-Servo stations allows you to introduce them to controls efficiently. If you need the benefits of modularity or plan to teach more advanced control topics and conduct research the SRV02-based system is the more suitable option. The QUBE-Servo features a self-contained USB-based DAQ interface panel (or an available direct I/O interface panel) and amplifier that can interface to LabVIEW™ or MATLAB®/Simulink® – based control software, plus two add-on experiment modules and courseware. The result: a superb multi-station, hands-on teaching lab for a surprisingly small outlay. Get as many as six QUBE Rotary Servo workstations for approximately the same price as one Rotary SRV02-based workstation. The compact QUBE-Servo offers any engineering university a new control theory teaching tool and new economies of scale. It offers advantages to schools both in developing nations and industrialized nations, since its affordability makes it an ideal way to give large numbers of students a practical, hands-on introduction to control design. With its built-in DAQ and amplifier, and single USB cable to connect to a PC or laptop computer, it’s simple for inexperienced students to set up and use. The fact that it has a small footprint, is robust and safe to use are additional advantages that deans and professors can appreciate. The low cost, self-contained QUBE-Servo is supplied with inertia disk and pendulum modules. QUBE-Servo and SRV02: What’s the Difference? The QUBE-Servo is not a replacement for the multi-purpose SRV02 Rotary Servo, any more than a compact car can outperform a high performance sports car. Their uses overlap to a degree, but they are not the same. The SRV02 Rotary Servo accepts many more add-on modules. It is highly reconfigurable and therefore suitable for research applications as well as teaching. The QUBE is, in fact, a complement to the SRV02, both functionally and economically, and can take its place alongside the SRV02 in any university control lab. Just as compact cars have an important place within the pool of vehicles you’ll find at driving school, a suite of compact QUBE-Servos constitute a pragmatic choice for teaching the basics of control. Any engineering institution that seeks to bring enhanced, hands-on learning experience to more and more of their students might wish to consider a test drive. For details on pricing for a multi-station QUBE-Servo lab, contact Quanser.